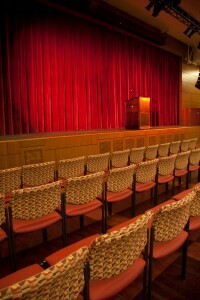 The Trojan Grand Ballroom is USC’s largest multipurpose room. Used as one large space or as four smaller rooms, the ballroom can accommodate banquet dinners, social dances, lectures, conferences, fairs and many other event types. In its inaugural year, the ballroom featured everything from a Shiny Toy Guns rock concert to a visit from President Barack Obama.